"We have lots of followers, and we don't intend to leave them hatless!" —Ellen Christine. For those of you who have walked by Ellen's vacant store on 18th Street cheer up! Ellen Christine has not closed, she has moved! Make an appointment to visit Ellen in her Greenwich Village showroom studio loft. Custom everything, and samples are available for sale, all seasons, all year. Ellen's hats are carried by Henri Bendel's, and at the Met Opera boutique. 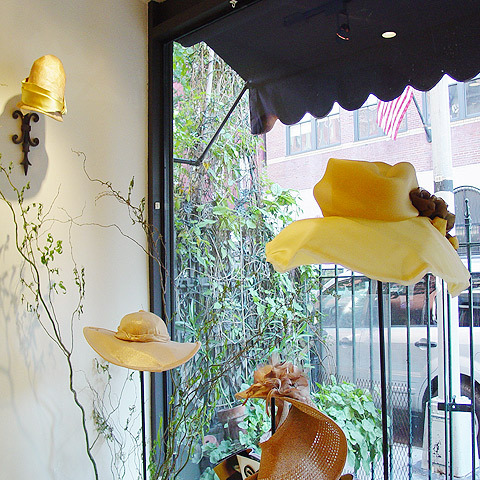 For her entire career Ellen Christine has immersed herself in a milliner's life of fashion and style. Her designs were initially for the trade only, but over the past sixteen years she has made her services available to retail clients too, creating classic but whimsical designs for those oh-so-vogue New York City ladies. Shoppers may purchase hats straight "off-the-peg"' as Ellen would call it or schedule a private fitting. Ellen has her own frisky way of working with her clients, helping them relax and enjoy the playfulness in wearing a hat. She believes a hat is a part of ones personality and makes everyday a special day! She offers Hollywood glamour hats for daily wear and celebratory occasions: bridal, cocktail or horse racing… Royal Ascot or Dubai? Ellen creates wearable hats from her active imagination for both men and women. She uses natural and organic materials with old world construction, basing her designs on historical reference and then adding a bit of a twist. Her silhouettes are unusual yet classic and make every customer into a movie star. Bring in a photo of your favorite Hollywood glamour hat to have custom made just for you! By Appointment only: Private fittings & custom designs; Pre-1947 vintage hats & clothing (deposit required).